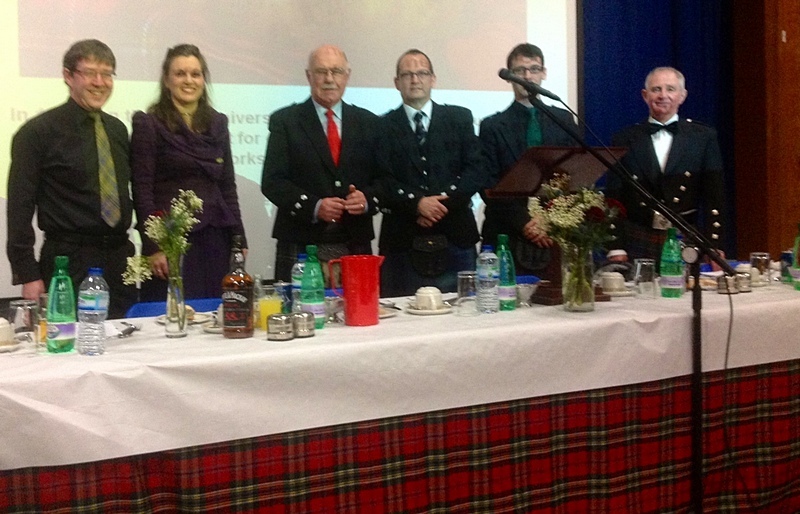 Laurencekirk Burns Appreciation Group held their annual Burns Supper in Mearns Academy on Saturday 26th January to which Bob Black, chairman for the night, welcomed a large audience to the annual celebration in memory of Robert Burns. The haggis was piped in by Ruairidh MacAlister and addressed by Gordon Stewart in the usual manner. A superb meal was then provided and served by Mearns Academy kitchen staff and thoroughly enjoyed by all. Alan Taylor, a traditional ballad singer from Alford then entertained the company with some hilarious and humorous songs before the Rev. John Anderson gave the main toast “The Immortal Memory” with various quotations from the works of Robert Burns to which he provided his own thoughts on how Robert Burns would have penned today’s dangerous crossing of the A90 Laurencekirk / Montrose junction in his time of need. To this he received a thunderous applause. The toast to “The Lassies” was proposed by Grant McIntosh in which he referred to various celebratory sportsmen and the support given to them by their wives and partners. The reply to the toast was then given by his cousin Anna Robson, a local lass and entrepreneur, revealing her various humorous encounters with the male species. Alan Taylor ended the evening with another group hilarious ballads and song with Ruairidh MacAlister on the bagpipes and Bob Black on the accordion for “Auld Lang Syne”. Peter Reilly gave a vote of thanks to the Chairman and Alastair Reid and his committee for organising the event. Top table guests in the photo, from L-R:- Alan Taylor, Anna Robson, Rev. John Anderson, Bob Black, Grant McIntosh, Gordon Stewart.